Fear of a Manchester United comeback is not setting in for Paris Saint-Germain following Tuesday's dominant performance at Old Trafford, insists Dani Alves. 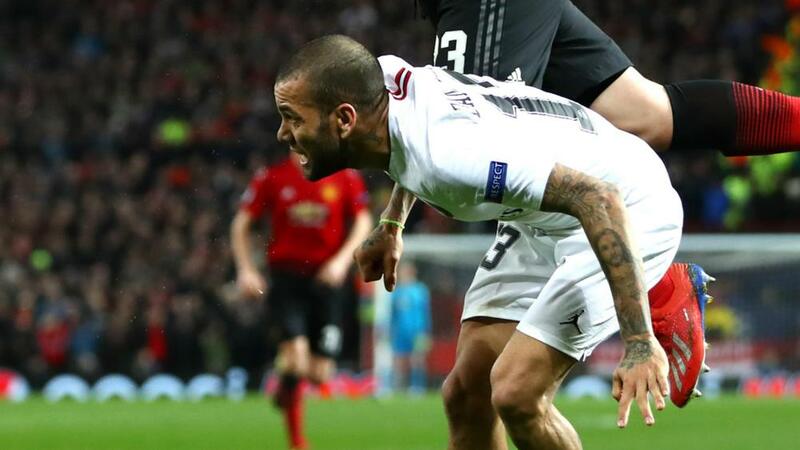 Dani Alves said Paris Saint-Germain have to win the Champions League once and for all this season following their first-leg victory over Manchester United in the last 16. Presnel Kimpembe and Kylian Mbappe scored in the second half as PSG outclassed United 2-0 at Old Trafford on Tuesday. PSG have dominated domestically in Ligue 1, but the French club's owners crave European success, having never won the Champions League. Asked if the Champions League is PSG's main target this season, veteran full-back Alves told reporters: "No, we invest because we have money, but it is not primordial. "Our goal is to win every competition. We work every day for it. To reach our goals, either the Cup, the Champions or the Ligue 1. But if you can win the Champions it will be welcome. "I think we have to lose the virginity in this competition this season once and for all. We are working hard for it." United were in the midst of an 11-game unbeaten streak since December but the Red Devils crashed to their first defeat under caretaker manager Ole Gunnar Solskjaer. PSG also inflicted the heaviest home European loss on United, who were left with a mountain to climb ahead of the return leg in Paris on March 6. "I am not scared of any comeback, because if you are scare you can't reach any goal," Alves said. "I think the past is the past, and you create history, don't tell them. "So, we have the opportunity to reach the next round, but we have to repeat what we've done today, because this team [Man Utd] have history in this competition as we haven't. So we should have a good performance to reach the objective." Meanwhile, PSG president Nasser Al-Khelaifi heaped praise on the Ligue 1 champions. "We are very happy, proud of the team, the coach and the fans. It's a magical evening, it's perfect," he said. "It was not easy with injuries [Neymar, Edinson Cavani] but we have great players, a great team, the match is perfect tonight. "We have character, because it's not easy to play here, Man United are one of the best teams in the world. But in terms of morale, we were at the top. We played 90 minutes, there is a second half at home. Do not think that the match is won. We must win at home on March 6." Van Dijk: Defending Messi Will Be "Very Hard"